Adjustable & padded hip belt. 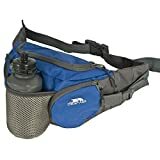 5 Litre hip pack. Multiple compartments. Adjustable & padded hip belt. Bottle holders with retainers. 1 x Drinks bottle. Composed of tough and durable 600d polyester ripstop. This entry was posted in Luggage and tagged Bottle, Bumbag/Waistbag/Hippack, Drinks, Trespass, Vasp by Bottled Sun. Bookmark the permalink.